Hey Clarocity, Give it up. It is time to face the facts! Even Clarocity shareholders are saying it is time to give it up. Read what they are saying here. Now take a look at all the debt Clarocity has repaid in shares of stock in lieu of cash payments. It is a routine process for them, without any hesitation. ”Clarocity Corporation provides real estate valuation solutions and platform technologies designed to address today’s dynamic housing market. Our innovative platform is driving the next-generation of valuation solutions such as MarketValue Pro (MVP) and BPOMerge and setting new standards in real estate valuation quality and reliability. Now I have no idea if the statement of the GSE’s using their products is true or not, but I do know Fannie and Freddie are in conservatorship because they were not profitable. The Collateral Underwriter used by the GSEs is seriously flawed and is a costly beast that has no sustainability either. Is Collateral Underwriter a Clarocity product? I sure hope not, but have no idea. The mere thought of my tax dollars being pumped into a company like Clarocity makes me angry. In March 2017, Clarocity was named the HousingWire Tech100 Winner. They claim the Clarocity “Platform delivers cost-effective and data-driven valuation products”. How can that be? The company has lost millions of dollars each year for the past 9 years. Does this sound very cost effective to anyone? So now think about this: An employee of Clarocity was name “Valuation Visionary of the Year” by the Collateral Risk Network. What were the standards for such an honor? Was any due diligence done by CRN? Why would any organization honor someone who supports costly inaccurate and inefficient technology that clearly has no sustainability? If a company develops, promotes and sells technology to produce automated values has not made one penny in 9 years, how are appraisers to be replaced by this technology? Clearly the technology will need constant revisions, updates etc. If the company has to continually borrowed millions of dollars to cover daily operating expenses and then issue shares of stock for repayment, this clearly is not a sustainable business model. If appraisers were to embrace such garbage, would the demise of this technology be sooner? Clarocity Stock closed on May 1, 2018 at $.045 per share. The lowest it has been in the past 12 months. OK. Interesting stuff. I’m a day trader as well as an appraiser. Gotta fund my retirement somehow. 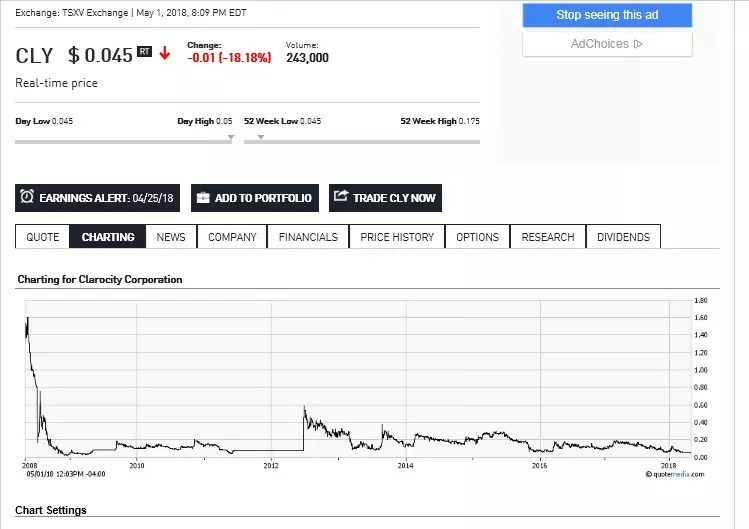 Go to Google and take a look at a Max chart for Clarocity Corp.. symbol CLY. It spiked around $5.19 just prior to the big real estate crash of 2008. It has NEVER recovered. I’m thinking .045 is less than a penny. lol. I recommend NVIV. It spiked 100% this week. Been watching it crawl into the bone yard for years. They’re finally on the verge of going somewhere with a bit of a miracle treatment. I expect it will pull back for a couple of days to weeks before taking off again. Patience is mandatory with this company. Institutional investors are finally taking notice again after their did a reverse split a week or so ago to put it back on their radar. Not saying it’s a guarantee by any means but it’s certainly worth doing research on. Update…they are now only ‘valued’ at 0.005 CDN (About $0.0038 US I’m told).They’ve been holding at half a cent for awhile now…my guess is Canadian Exchange doesn’t list lower than 1/2cent per share. Hope no one invested more than $10.00 back in May. Anyone affiliated with CRN is on my DNU list. Does anyone else realize the connection between Collateral Risk Network (aka Joan Trice) and Clarocity? Carol Trice, Joan’s sister is the Director of Quality Review Services for Clarocity. Ernie Durbin is a major share holder of Clarocity. It does not take a genius to figure out what is really going on here. weren’t these the same people that “put out” the Annual C&R Fee Survey by a “disinterested third party”? If only there was some law ……………….. Anyone been paid by Clarocity in the last 45 days? Word on the street isn’t good. From the same wonderful folks that first defrauded appraisers and consumers alike with ZAIO and its $10,000 territories and phony “USPAP compliant” garbage reports? I wouldn’t buy a used car from these people. Why would anyone else buy their bull%#&^? Hahaha ! Valuation sell out! Taking a corporate stock from it’s high to an amount that is less than 1/120th of that amount certainly is visionary. So is conning the appraisers that were owed huge amounts of unpaid fees to accept near worthless stocks as compensation. Definitely demonstrates a company or individual who strives to better the industry for their peers. I’m not exactly sure who their peers are aside from other software system designers hustling phony alternative systems in lieu of real appraisals performed to USPAP..
A company that simply shrugs off such a debacle as ZAIO was and that then holds itself out to be an expert in anything is certainly an example of innovative hutzpah. Leadership is exemplified by no one (as far as we know) actually going to jail over the ZAIO fiasco…then again maybe district attorneys of attorney’s general never actually went to one of the presentations. I get why Joan’s crn gives him an award. Her sister is an exec at Clarocity. What I cant for the life of me understand is why the national Association of Realtors has him as a featured speaker or panelist at their May 15th meeting on alternative valuation. Has NAR really sunken this far? What’s next, a conference on corporate ethics with Wells Fargo as a featured presenter? I just looked at some of the comments from the shareholders.. OMG. these people actually believe someone will purchase this company and they will make money! Do they not realize the idiots running the company have never been successful. Not now or in their previous companies that are no longer in business. Clarocity does not have a product people want and the evidence shows no one is buying their garbage. The best scenario for the investors is to sell now and cut your losses. When this company goes belly up they will get nothing. Don’t worry, Corelogic will buy it. CoreLogic only purchases companies that have value. Clarocity has no value. Has not had any value in 9 years according to their own financials. Interestingly enough, Corelogic, clever bunch of guys. Related, attached & next post related attachment pair. Check the dates. Edit. Picked the wrong snip. Delete this will try again here. delete second, this is the one. I read those once before too. People talking out their blowholes like they are stock-savvy. Entertaining and eye opening. Proves one doesn’t have to have any brains at all to have money…only to keep it. 100,000 shares at yesterdays posted price is what, $4,500? I wonder who would have been dumb enough to buy 100,000 shares (at any time)? You’d think that the fact it cant be traded (or even offered) on any U.S. Exchange would have been a worth while hint. Guess that says a LOT about his peers…and THEIR judgement. being a major shareholder doesn’t hurt. Wasn’t there something about a dividend and…………………. Yea, we need some of them ” thought leaders” up in here ! You know, it’s the modeling that is not working. Amc’s are like telecoms with an ever shrinking, permanently limited call list. The notion they would be able to go public and pay both investors and overhead on the down swing, too much overhead I guess. Over 120,000 appraisers with careers ruined, and 10 years later, full circle is finally coming around. If only there had not been the clever multi billion dollar play to leave improperly co mingled fees going, and instead force them to bill separately. Oh god, read this, It’s unbearable to read. 10b dollar market, and they’re ‘peeling away’ us antiquated manually orientated appraisers and our antiquated ways. These companies don’t just want a piece, they want it all. Put that 10,000,000,000 back in the hands of appraisers, watch us flourish and work diligently to protect American interests first! Q! O.k, I have now figured this out. They’re Canadian. On a related note, the push back against hybrid products likely crushed them. Yea Shane Copland is a talker. He has no clue on how to deliver what he states. Hence, 9 years of multi-million dollar losses to prove he is incapable of delivering. IF he had ever had ability to offer through U.S. Exchange it’s likely SEC would have been after him immediately following ZAIO disaster…some would call a fraud rather than disaster. I remember attending a marketing presentation for it with my old business partner. They even had some ex Assistant U.S. Secretary of some BS agency or another as a purported Director & speaker telling us all how ZAIO assignments were all USPAP compliant. We knew it was garbage halfway through the presentation. It took that long because we politely gave them the benefit of the doubt through the first half of presentation. Well THIS certainly explains how they do what they do for so long. Check this out. Definitely something going on at Clarocity. Stock now at $0.04 per share. Should states pull their license to operate? Yes, but not for the cited reason of low stock prices.Clarocity stocks cannot legally be offered for sale in the USA. Canada has no national stock exchange regulatory agency. Its all done on a provincial basis. Clarocity is traded in Calgary I think. IF anyone cared, they should have been forced out of business for the ZAIO scam of years ago. My guess is that they are just going to keep throwing you know what against the wall until some moron says “Gee, that smells just like petunias. I think I’ll have some of that.” Last thing I read about them seemed almost like an exact rehash of the old ZAIO scam being repackaged as a ‘new’ and novel idea..all over again. “StableView“) announces that it has acquired control or direction over warrants to acquire control or direction of up to 1,155,000 common shares (“Warrants“). Each Warrant entitles the holder to purchase one common share at an exercise price of $0.10 per common share until November 14, 2018. Before the issuance, StableView exercised control or direction over 38,883,362 Warrants representing approximately 30.70% of Clarocity’s outstanding common shares on a fully-converted basis. Find the missing revenue, round and round the accounting goes. A company wide audit for any given major amc would likely yield similar results. ‘Investors’ will be scratching heads wondering why appraisers are making it so difficult to sustain this business model. I vote for mortgage broker management companies. Those guys just can’t be trusted to manage these processes on their own, they need additional telecom based management. Let’s provide separation from saleseman to the customer, that’s where the real protection is needed anyways. If the shoe fits, the companies whom are largely responsible for this should wear it too. Wow. GAME OVER FOR CLAROCITY – This just took a serious turn downward. Clarocity debt is now guaranteed by their 100% owned subsidiary Valuation Vision. Along with it comes much tougher terms. So if I understand what just happened by reading between the lines.. The automated technology designed to replace appraisers is not profitable, so the traditional appraisal division is picking up the tab. Clarocity issued an aggregate amount of $467,500 in principal amount of debentures (“Debentures”) at a price of $100 per $100 principal amount of Debenture. The Debentures will bear an interest rate of 24% per annum payable quarterly in common shares (“Common Shares”) or cash, at the option of the holder. The Corporation may on 45 days notice and Stableview may on 30 days notice require repayment of all outstanding Debentures together with any accrued and/or unpaid interest and a 30% repayment bonus. The Debentures have been guaranteed by the Company’s wholly-owned subsidiary, Valuation Vision, Inc. (the “Guarantor”), and have been secured against all of the Company’s and the Guarantor’s property, assets and patents and will be registered in all of the jurisdictions in which the Company and the Guarantor carry on business. In addition, the Company issued 1,402,500 common share purchase warrants (“Warrants”). Each Warrant entitles the holder thereof to purchase one Common Share in the capital of the Company at $0.10 per Common Share, exercisable until November 14, 2018. Entitled to buy one share for $0.10 where current shares are only trading at $0.045 SUCH A DEAL!!! I’m guessing it was that kind of thinking that made ZAIO the huge success that it was. Oh wait, that was ANOTHER LOSER before it became Clarocity. Now with that kind of leadership SURELY they must be entitled to some kind of an award…or maybe speaking position at a NAR conference shouldn’t they? April 05, 2018: Clarocity Corporation (TSXV:CLY; OTCQB:CLRYF) (the “Company” or “Clarocity”) today announced that it will issue 5,351,210 common shares to debentureholders in lieu of cash as consideration for interest payments due March 31, 2018, for the aggregate amount of $299,668. Guess it’s easy to issue over 5 million shares of worthless stock to anyone who was stupid enough to but a debenture from this company. Just my opinion, your opinion may vary slightly. Also…..on the balance sheet the absolute highest percentage of assets…..is in the intangibles. Almost 50%. lol. Anybody know where Kirchmeyer went???? What’s a Kirchmeyer…and should we care? Speculating, but possibly accurate. Solidify chomped them up several years ago. Related, battle of the tech giants and venture capitalists. Well that’s just wonderful. This last one is not a necessary read but has a lot of name dropping and lends interesting perspective to why powerful companies are so eager to replace regular licensed persons whom would represent individuals. It’s the forest vs trees and subsequent perspective argument. Amc’s no longer see themselves as servicing for lenders or appraisers, they’re positioning themselves as major players in a bigger picture. Very interesting perspective piece. Joan needs a new car !!! Clearbox is offering additional services to our already existing robust database of AMC state rules and regulations. Our mission is to ensure that our subscribers stay abreast of the changing regulatory landscape. The AMC compliance knowledgebase will be easy tool that you just shouldn’t do without. And Fannie Mae doesn’t give a crap about value, condition or marketability. Previous story Who’s to Blame?